Many of the photos in this series come from the collection of An Iodhlann , the Tiree historical centre, and are reproduced by kind permission of the An Iodhlann Management Committee, individual donors of the photos, and with the assistance of Janet Bowler, Archive Manager. The captions draw heavily on notes written by Catriona McLeod, An Iodhlann Archivist 1998-2008, and her work is gratefully acknowledged. (photo courtesy of An Iodhlann & Angus Munn). 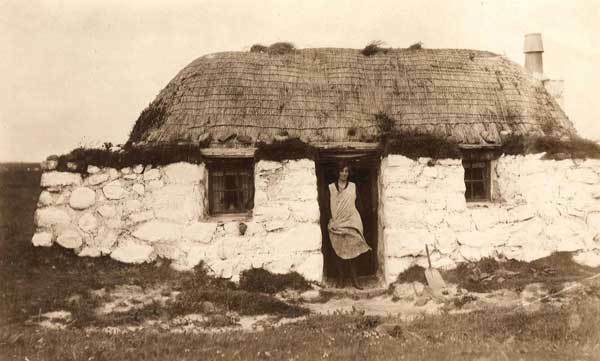 Photograph of Morag Cameron in the doorway of her traditional Tiree thatched house at Moss. The thatch is covered by a net of coir rope weighted down with stones. The outside and inside walls were painted with white lime made by burning limpet shells. In the 1700s and 1800s houses like this were occupied by families of up to 12 or more. Only a few now remain on Tiree. 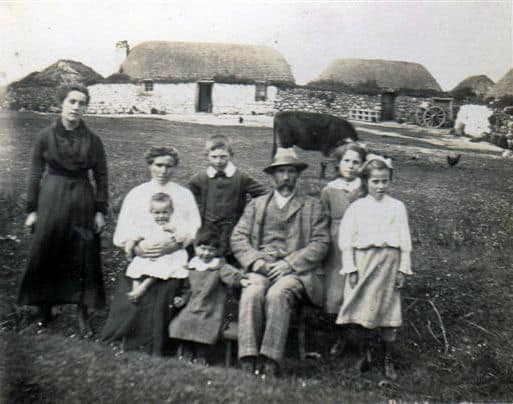 Pictured c.1915 in front of their traditional Tiree croft home at Kilmoluaig are Donald McDonald and his wife Janet Wotherspoon Galbraith with their children (l to r) at rear - Jessie, Angus, Sarah & Ann, and at front - Catherine (baby) & Jemima. 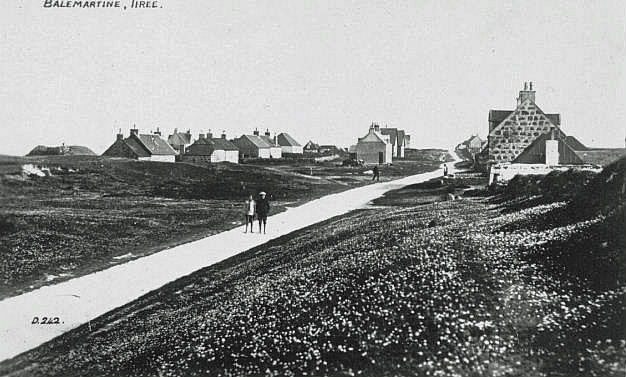 The croft buildings in the background are typical of those in Tiree in the 1800s, with the house, byre, sheds and stackyard built in a line. Balemartine is the largest township in Tiree, and perhaps the only one that might be called a village. In the 1800s many of the families living here were engaged full or part-time in cod and ling fishing using small open boats, however they were generally less successful than the larger and better equipped fishing boats from Barra or Aberdeenshire that visited the island each year. The present building, on the site of an ancient castle on an island in Loch an Eilein, was built in 1748 by the Earl of Argyll as a residence for his factor and members of the Argyll family when visiting Tiree. 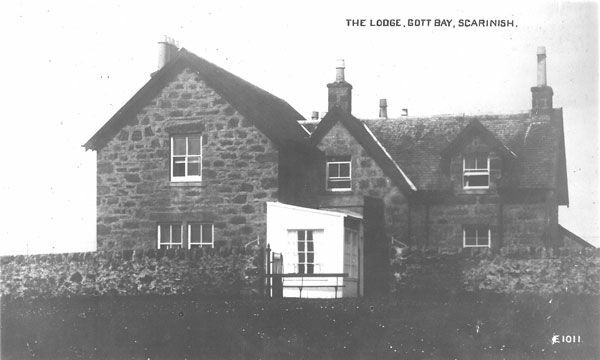 The island was joined to the mainland by filling in a section of the surrounding loch when Island House was built. 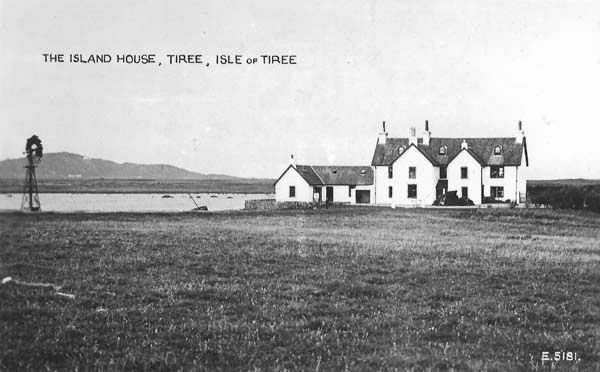 The original building had been used as a school and was enlarged in the 1890s for Lady Victoria Campbell (1854-1910), daughter of the 8th Duke of Argyll, who made it her home on Tiree. She was an activist with a special affection for Tiree and its people, organizing needlework and woodwork classes for children and lobbying for improvements in infrastructure and services for the island. 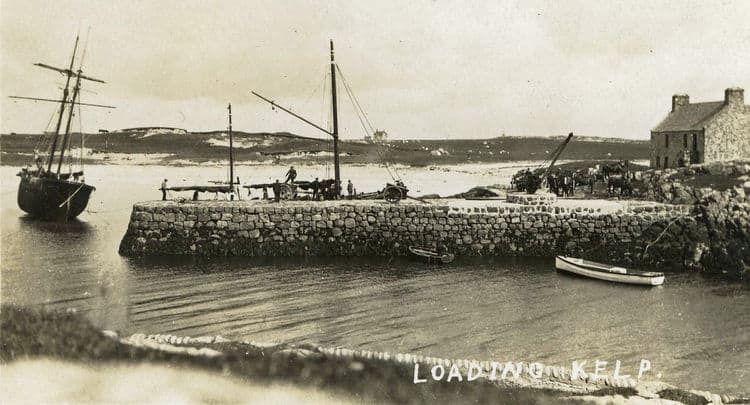 Before the new deep-water pier at Gott Bay was completed in 1913, the old pier in Scarinish Harbour was the arrival and departure point for most of the people, goods and livestock to and from Tiree. Scarinish was a hazardous harbour - it was shallow, the entrance was dangerous, and ships had to stand off in the harbour or outside while people, cargo and animals were transferred between the ship and the pier in open boats. Landings and loadings were not possible in rough weather. Eventually, after years of agitation by islanders and Lady Victoria Campbell, construction of a new pier began in 1909 at Gott Bay. 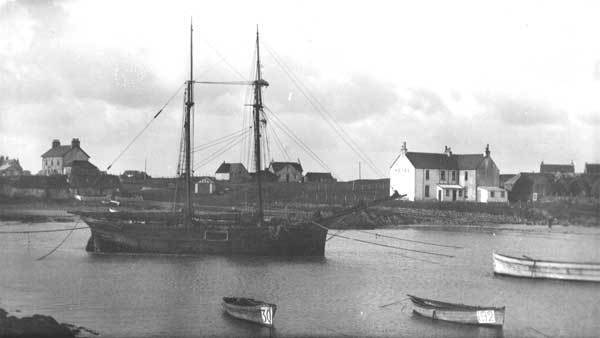 This photograph from the 1920s or 1930s shows the schooner Mary Stewart in Scarinish Harbour. In the left background is MacArthur's General Store and in the right background is the Temperance Hotel. Mary Stewart was operated by Donald MacLean of Scarinish and his sons on the west coast of Scotland until the late 1930s carrying coal and other cargo. Her remains can still be seen in Scarinish Harbour. 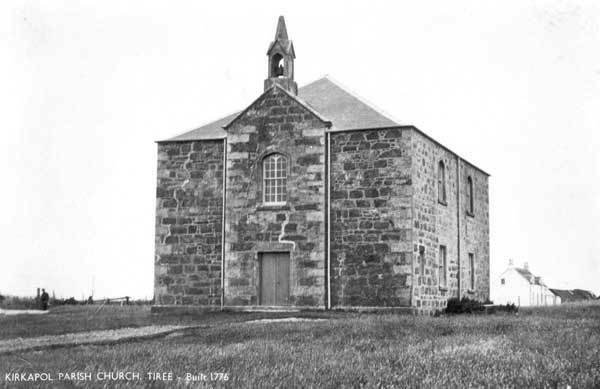 The Kirkapol church, built in 1842 to replace an earlier church built in Scarinish about 1776, serves the eastern half of Tiree. 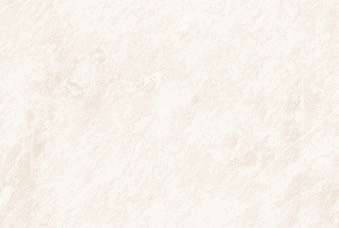 It is built of local stone and granite brought from the Ross of Mull. Nearby are the remains of an early parish church dedicated to St Columba, dating from the 14th century, and a small 13th century chapel. The ruins of two ancient chapels at Kirkapol are the best known and most conspicuous of old church remains in Tiree. The earliest of the two is the small chapel on a rocky knoll built in the 13th century and thought to have been dedicated to St Brendan. The larger chapel dates from the late 14th century and was dedicated to St Columba. 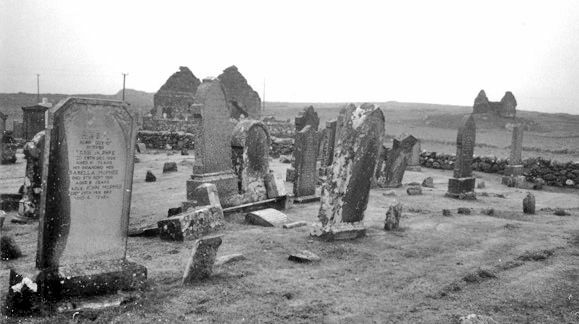 It was the parish church for the eastern half of the island until a new parish church was built in Scarinish about 1776. There is a small graveyard by this chapel and a larger graveyard, still in use, nearby. 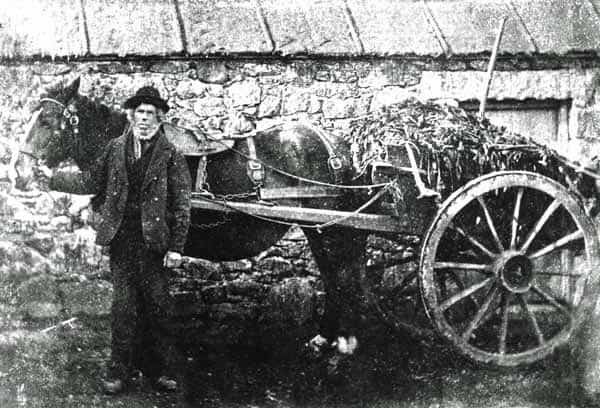 The photo shows Lachlan MacPhail with a cartload of seaweed outside his shepherd's cottage at Crossapol. Kelp harvested annually from the seaweed forests that surround Tiree was traditionally used as a manure to improve the sandy soils of the island. Kelping - the harvesting, drying and burning of kelp to produce an ash rich in soda and potash for use in soap and glass manufacture - was a major industry in Tiree in the late 1700s and early 1800s, but it collapsed at the end of the Napolionic Wars when cheaper product became available again from Spain. Commercial kelp harvesting had a brief revival in the late 1800s when a factory, the Glassary, was established at Middleton to extract iodine from the dried seaweed. The factory closed in 1901. Today, some dried seaweed is exported to the mainland for processing to extract alginate used in food thickenings. 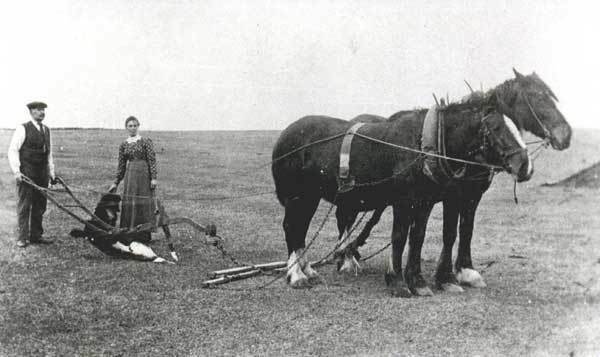 The photo shows John MacPhail and his wife, Christina, of Balinoe with their horse-drawn plough used for preparing the ground for planting cereal crops or potatoes. The plough is drawn by two Clydesdale horses. Tiree was famous for its pure-bred Clydesdale and lighter cross-bred draft horses. 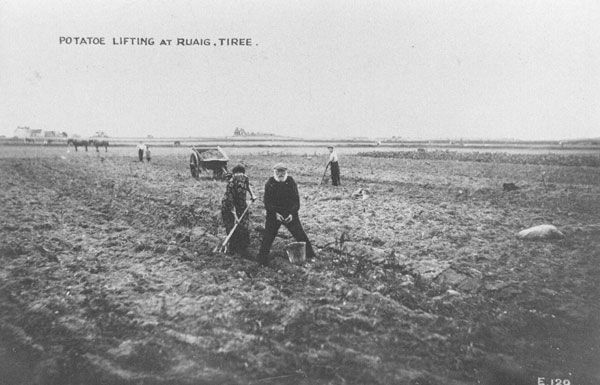 The photos shows Nancy & Alexander MacInnes harvesting potatoes at Ruaig in the 1920s. Potatoes were introduced to the Hebrides in the 1740s, and by 1800 had supplanted oats and barley as the staple food of the islands. The outbreak of potato blight that began in 1846 caused widespread famine in Europe, Ireland and the Hebrides, and lead to mass emigrations in the late 1840s and 1850s from an over-populated and impoverished Tiree. The photo shows two women taking their eggs to the co-op depot at Cornaigmore in the 1920s. The depot was at the croft in the backgound, owned by Archie Maclean. There were a number of such depots on the island where eggs were collected for shipment to the mainland. 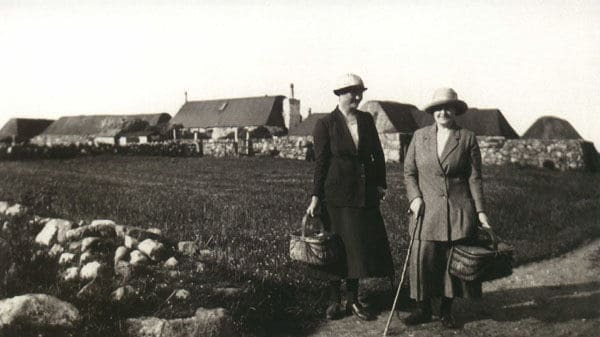 The export of eggs began in the 1800s, and in the early to mid-1900s there were about 8,000 hens and ducks on crofts in Tiree providing eggs for local sale and export. The industry has since declined. 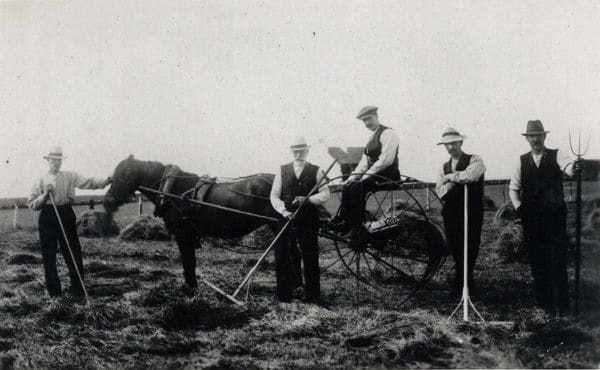 The photo c.1900 shows Donald Maclean of Cornaigbeg (centre) and his sons (left to right) Alexander, Archibald, Donald & Thomas making hay at Cornaigbeg. Haycocks, made by raking the cut hay into conical mounds to dry out, can be seen in the background.